The objective of this work is to investigate the effect of dip-coating parameters on the performance of Alumina-PDMS hybrid nanofiltration membranes for water desalination. Ceramic supports used in this work were prepared with a 340 nm average pore size and 34% total porosity. The aim is to determine optimum conditions of dipping time, PDMS concentration, and withdrawal speed in order to achieve high rejection and flux values. Dip-coating parameters were considered as dipping time (60 - 120 s), withdrawal speed (5 - 15 mm/s) and PDMS concentration (10 - 20 wt. %). Hybrid membranes were characterized using FE-SEM and FTIR analysis techniques. Pure water flux and salt rejection were also measured to evaluate the rejection performance. Alumina-PDMS hybrid nanofiltration membranes fabricated with dipping time = 120 s, withdrawal speed = 15 mm/s and 10 wt. % PDMS exhibited the best performance giving 30.5% rejection for NaCl and 53.8% for Na2SO4. Membrane separation processes have found several applications in various industrial processes. 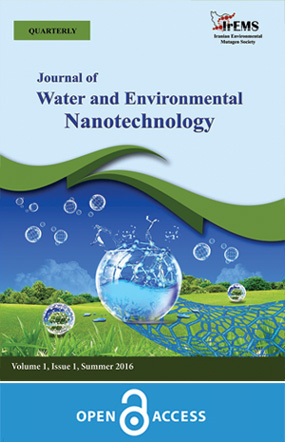 Nanofiltration with a low energy consumption can be a good alternative for separation purposes as a pressure driven membrane-based process intermediate between reverse osmosis (RO) and ultraﬁltration (UF), rejecting very small moieties due to relatively high charge and pores smaller than 2 nm . Inorganic-organic hybrid nanofiltration membranes can have advantages such as selectivity, high flux as well as chemical and thermal resistance with mechanical stabilities under pressures up to 20 bar. Much focus is devoted to the development of new classes of membranes for improving ﬁltration performance under solvent resistant conditions, i.e. improving chemical and mechanical stability, reducing swelling effects of polymeric membranes and enhancement of solvent afﬁnity . Hybrid membranes can be prepared using ceramic substrates and polymeric top layers through sol-gel dip-coating [3, 4], spray coating , self-assembly , grafting  and spin coating . Among these, dip-coating as a simple and inexpensive technique is considered as one of the most desirable alternatives. Dip-coating provides opportunities to explore the impact of coating parameters such as polymer concentration and dipping time during the fabrication procedure to obtain a membrane with the desired pore diameter and flux-rejection combination . Various polymers are used as the top layer of hybrid ceramic-polymer membranes. PDMS with a unique set of characteristics including high free volume, backbone flexibility, thermal and chemical stability, hydrophobicity and solubility in non-polar solvents , is among polymers used as the thin selective layer in different membrane processes like pervaporation  and thin film composite (TFC) nanofiltration [2, 12]. PDMS membranes are mostly prepared on polymeric supports such as polyethersulfone (PES) , polyethylene (PE) , polysulfone (PS) , cellulose acetate (CA) , poly(vinylidene fluoride) , polyetherimide (PEI) , polyacrylonitrile (PAN)  and polyamide (PA) , although ceramic supports are also utilized. For example, Hong et al. carried out pervaporation of IPA and water using PDMS/ceramic composite membranes prepared via dip-coating. The variation of selectivity and flux at various feed compositions and operating temperatures was explained through plasticization by IPA and capillary condensation of water . Song & Hong fabricated cellulose acetate–ceramic membranes by dip-coating and rotation drying technique using a ceramic support with a 100 nm surface average pore size and CA concentration of 20% tested for dehydration of ethanol and isopropanol . Xiangli et al. prepared a PDMS/ceramic composite membrane for pervaporation. The results showed that polymer concentration was the most significant variable influencing permeation and selectivity. Maximum flux of 19.5 kg m-2 h-1 was obtained under following preparation conditions: polymer concentration = 7.4wt%, crosslink agent concentration = 10wt.% and dip-coating time = 60 s . Kim et al. coated PDMS on a polysulfone (PSF) support for propylene recovery from off-gas stream. They prepared a novel organic-inorganic composite membrane by adding silica nanoparticles to the PDMS solution and the results showed enhanced separation factor and propylene permeance enhancement from 5.2 to 7.3 and 31 to 36 GPU, respectively (1 GPU equals 10−6 cm3/cm2 s cmHg) . Polysiloxane-based polymers like PDMS have often been used as polymeric SRNF [2, 10]. Pinheiro et al. designed a new fabrication method for grafting PDMS on a supported γ-alumina membrane (pore size = 5 nm) using polysiloxane mono(2,3 epoxy)polyether terminated polydimethylsiloxane:(PDMS) . Tanardi et al. described grafting of mesoporous alumina membranes with hydride terminated polydimethylsiloxane with vinyltriethoxysilane linking agent to create a dense network structure grafted inside the ceramic pores. Grafting reactions were successfully carried out and approved by permeability-rejection tests. Coupling agents were found to create network structures with a higher density grafted in the γ-alumina pores . Nandi et al. prepared CA–ceramic composite membranes using the dip-coating technique. Ceramic supports were prepared from kaolin with an average pore size of 560 nm and total porosity of 33%. Dip-coating parameters were the concentration of CA solution (2-8 wt.%) in acetone and dipping time (30-150 s) . In this study, hybrid nanofiltration membrane preparation using dip-coating is performed for investigation of dip-coating parameters. Low-cost ceramic supports were prepared using α-alumina powder as the raw material . According to previous studies, alumina-PDMS hybrid membranes are used for pervaporation [21, 26] and SRNF . However, this study is devoted to desalination for investigating the dip-coating parameters (dipping time, withdrawal speed) and PDMS concentration in n-heptane in order to optimize the membrane performance regarding flux and rejection of inorganic salts. α-Alumina (Al2O3), Polyvinyl alcohol (PVA), n-heptane, Tetraethyl orthosilicate (TEOS) and dibutyltin dilaurate were purchased from Merck Co. and used as received. Hydroxy terminated polydimethylsiloxane (PDMS) was obtained from Sigma-Aldrich (Mw= 18000 g mol-1) and a kinematic viscosity of 750 cSt. Sepahan Irman Tech dip-coater (Iran) was also used for film application. Surface and cross-section morphologies of the composite membranes were characterized by SEM and FE-SEM. Samples were dried under vacuum at 25 °C for 40 min and coated with gold before SEM imaging. The chemical composition of the top layer of the modified support or the Al2O3/PDMS composite NF membrane was characterized using ATR-FTIR technique. The substrate is prepared through dry casting technique (Fig. 1). A proper amount of alumina powder is mixed with a 7 wt% PVA solution. The suspension is pressed in a template, then sintered at 1250 ºC for 2 h .
PDMS/ceramic composite membranes were prepared by the conventional dip-coating method. PDMS was dissolved in n-heptane and then the crosslinking agent (TEOS) and 0.2 wt% catalyst dibutyltin dilaurate were added to the polymer solution. The polymer mixture was stirred at room temperature for 30 min and degassed under vacuum. The outer surface of the ceramic support was polished with 600 mesh sandpaper and washed several times with deionized water under ultra-sonication and dried in open air at room temperature. Nomenclature of various composite membranes fabricated with varying PDMS concentration in n-heptane (10 – 20 wt. %), dipping time (60 – 120 s) and withdrawal speed (5 –15 mm/s) are presented in Table 1. Rejection performance tests were conducted with a cross-flow membrane module at 20 °C. The schematic diagram of the apparatus is shown in Fig. 2. Where V is the total mass permeated during the experiment time interval t and A is the effective membrane area. Where, Cs and Cd denote the salt concentrations of feed and permeate. Fig. 3 shows the FE-SEM image of the alumina substrate, showing a dense and uniform structure preventing crack formation at high operating pressures. FE-SEM micrograph of the hybrid alumina-PDMS membrane (M2) substrate structure is given in Fig. 4 which confirms PDMS coating on the substrate surface. The modified support and hybrid NF membranes (M2) were characterized using ATR-FTIR (Fig. 5). The peaks at 2968 cm-1 and 2924 cm-1 are ascribed to C–H asymmetric stretching and symmetric stretching of methyl (CH3-) groups of PDMS. The strong peak at 1245 cm-1 is caused by symmetric C–H bending and peaks at 871 cm-1 and 791 cm-1 are caused by Si–C vibration and CH3 rocking from the SiCH3 group. The two peaks at 1095 and 1017 cm-1 are ascribed to the Si–O–Si bond. These peaks at 791, 1017, 1095, 1245 cm-1 and 2968 cm-1 confirm the presence of polydimethylsiloxane groups on the α-Al2O3/PDMS membrane [4, 27]. Dip time and withdrawal speed are investigated as well as polymer concentration. The variations of parameters are given in Table 2 with their relative rejection characteristics. High dip time and low polymer concentration are needed to obtain high salt rejection. At 120 s dip time and 10 wt. % polymer concentration and 15 mm/s withdrawal speed the highest rejection is obtained as 30.5% for NaCl and 53.8% for Na2SO4. Fig. 6 shows that pure water fluxes of the membrane support and hybrid NF membrane vary with the operating pressure. Pure water flux is 81 L m−2 h−1 for the membrane support at 0.6 MPa operating pressure which is in agreement with Gestel’s data for inorganic composite membranes . Fig. 6 shows the effect of pressure on pure water flux of hybrid nanofiltration membranes with different dip-coating parameters. Pure water flux for both support and Hybrid NF membrane exhibits a linear relationship with pressure and pure water flux is enhanced by increasing the operating pressure . Salt concentration can influence the rejection performance of hybrid membranes . Fig. 7 shows the effect of feed concentration on the rejection for single salt NaCl and Na2SO4 solutions. All filtration measurements were conducted at 0.5 MPa based on M2-120-10-15 dip-coating parameters. In 0.0001–0.04 mol L-1 concentration range, alumina-PDMS membrane exhibited higher retention rates toward di-valent cations compared to the mono-valent cation. Decreased rejection with salt concentration can be explained by the decreased thickness of the electric double layer with increased salt concentration (i.e. higher ionic strength) and hence lower rejection rates [30, 31]. Figs. 8, 9 and10 show the effect of operating parameters on the salt rejection of the composite NF membranes for NaCl and Na2SO4 solutions. All filtration measurements were conducted at feed concentration = 0.001 mol L-1. Fig. 8 shows the rejection of Na2SO4 and NaCl increased from 45.8 to 53.8 and 23.7 to 30.5 while dipping time was increased from 60 (M1-60-10-15) to 120 s (M2-120-10-15). This salt rejection enhancement can be due to the increased polymer coating on the ceramic membrane resulting in smaller porosity and pore sizes in the hybrid membrane. So, due to sieving mechanism, salt rejection is increased . Fig. 9 shows the rejection of Na2SO4 and NaCl increasing from 46.1 to 53.8 and 22.1 to 30.5 when the polymer concentration was reduced from 20 wt.% (M3-120-20-15) to 10 wt% (M2-120-10-15). So, increasing the polymer solution concentration results in the reduction of salt rejection. According to Fig. 10, rejection of Na2SO4 and NaCl are enhanced from 46.1 to 50.1 and 22.1 to 27.0 when the withdrawal speed was reduced from 15 mm/s (M3-120-20-15) to 5 mm/s (M4-120-20-5).So, reducing the withdrawal speed can increase the salt rejection. In this study, α-alumina-PDMS hybrid nanofiltration membranes are fabricated using the dip-coating technique for investigation of dip-coating parameters. Low-cost ceramic supports were prepared using α-alumina powder as raw material for water desalination. Effect of Dip-coating parameters, PDMS concentration in n-heptane (10 wt. % to 20 wt. %), dipping time (60 to 120 s) and withdrawal speed (5 mm/s to 15 mm/s) on the prepared membranes were studied. The results of FE-SEM and ATR-FTIR analyses indicate the coating of PDMS on the support. The analysis shows that dip-coating parameters of (M2-120-10-15) membrane have better performance compared to other membranes. For the Hybrid NF membrane, rejection of 30.5% for NaCl and rejection of 53.8% for Na2SO4 are obtained. Thanks to Iran National Science Foundation (INSF) for financial support of the project. 1. Chen Z, Chen F, Zeng F, Li J. Preparation and characterization of the charged PDMC/Al2O3 composite nanofiltration membrane. DESALINATION. 2014;349(Supplement C):106-14. 2. Pinheiro AFM, Hoogendoorn D, Nijmeijer A, Winnubst L. Development of a PDMS-grafted alumina membrane and its evaluation as solvent resistant nanofiltration membrane. J Membr Sci. 2014;463(Supplement C):24-32. 3. Cuiming W, Tongwen X, Weihua Y. Fundamental studies of a new hybrid (inorganic–organic) positively charged membrane: membrane preparation and characterizations. J Membr Sci. 2003;216(1):269-78. 4. Wu C, Xu T, Gong M, Yang W. Synthesis and characterizations of new negatively charged organic–inorganic hybrid materials: Part II. Membrane preparation and characterizations. J Membr Sci. 2005;247(1):111-8. 5. Sachdeva S, Kumar A. Synthesis and modeling of composite poly (styrene-co-acrylonitrile) membrane for the separation of chromic acid. J Membr Sci. 2008;307(1):37-52. 6. Chen Y, Xiangli F, Jin W, Xu N. Organic–inorganic composite pervaporation membranes prepared by self-assembly of polyelectrolyte multilayers on macroporous ceramic supports. J Membr Sci. 2007;302(1):78-86. 7. Yoshida W, Cohen Y. Ceramic-supported polymer membranes for pervaporation of binary organic/organic mixtures. J Membr Sci. 2003;213(1):145-57. 8. Song KM, Hong WH. Dehydration of ethanol and isopropanol using tubular type cellulose acetate membrane with ceramic support in pervaporation process. J Membr Sci. 1997;123(1):27-33. 9. Nandi BK, Uppaluri R, Purkait MK. Effects of dip coating parameters on the morphology and transport properties of cellulose acetate–ceramic composite membranes. J Membr Sci. 2009;330(1):246-58. 10. Tarleton ES, Robinson JP, Salman M. Solvent-induced swelling of membranes — Measurements and influence in nanofiltration. J Membr Sci. 2006;280(1):442-51. 11. Liu G, Gan L, Liu S, Zhou H, Wei W, Jin W. PDMS/ceramic composite membrane for pervaporation separation of acetone–butanol–ethanol (ABE) aqueous solutions and its application in intensification of ABE fermentation process. Chem Eng Process. 2014;86(Supplement C):162-72. 12. Dutczak SM, Luiten-Olieman MWJ, Zwijnenberg HJ, Bolhuis-Versteeg LAM, Winnubst L, Hempenius MA, et al. Composite capillary membrane for solvent resistant nanofiltration. J Membr Sci. 2011;372(1):182-90. 13. Wu H, Zhang X, Xu D, Li B, Jiang Z. Enhancing the interfacial stability and solvent-resistant property of PDMS/PES composite membrane by introducing a bifunctional aminosilane. J Membr Sci. 2009;337(1):61-9. 14. Li S-Y, Srivastava R, Parnas RS. Separation of 1-butanol by pervaporation using a novel tri-layer PDMS composite membrane. J Membr Sci. 2010;363(1):287-94. 15. Peng F, Liu J, Li J. Analysis of the gas transport performance through PDMS/PS composite membranes using the resistances-in-series model. J Membr Sci. 2003;222(1):225-34. 16. Li L, Xiao Z, Tan S, Pu L, Zhang Z. Composite PDMS membrane with high flux for the separation of organics from water by pervaporation. J Membr Sci. 2004;243(1):177-87. 17. Vankelecom IFJ, Moermans B, Verschueren G, Jacobs PA. Intrusion of PDMS top layers in porous supports. J Membr Sci. 1999;158(1):289-97. 18. Zhao C, Li J, Qi R, Chen J, Luan Z. Pervaporation separation of n-heptane/sulfur species mixtures with polydimethylsiloxane membranes. Sep Purif Technol. 2008;63(1):220-5. 19. Stafie N, Stamatialis DF, Wessling M. Effect of PDMS cross-linking degree on the permeation performance of PAN/PDMS composite nanofiltration membranes. Sep Purif Technol. 2005;45(3):220-31. 20. Sadrzadeh M, Shahidi K, Mohammadi T. Effect of operating parameters on pure and mixed gas permeation properties of a synthesized composite PDMS/PA membrane. J Membr Sci. 2009;342(1):327-40. 21. Ki Hong Y, Hi Hong W. Influence of ceramic support on pervaporation characteristics of IPA/water mixtures using PDMS/ceramic composite membrane. J Membr Sci. 1999;159(1):29-39. 22. Xiangli F, Chen Y, Jin W, Xu N. Polydimethylsiloxane (PDMS)/Ceramic Composite Membrane with High Flux for Pervaporation of Ethanol−Water Mixtures. IND ENG CHEM RES. 2007;46(7):2224-30. 23. Kim H, Kim H-G, Kim S, Kim SS. PDMS–silica composite membranes with silane coupling for propylene separation. J Membr Sci. 2009;344(1):211-8. 24. Tanardi CR, Pinheiro AFM, Nijmeijer A, Winnubst L. PDMS grafting of mesoporous γ-alumina membranes for nanofiltration of organic solvents. J Membr Sci. 2014;469(Supplement C):471-7. 25. Khalili M, Sabbaghi S, Zerafat MM. Preparation of ceramic γ-Al2O3-TiO2 nanofiltration membranes for desalination. Chemical Papers. 2015;69(2):309-15. 26. Xu R, Liu G, Dong X, Wanqin, Jin. Pervaporation separation of n-octane/thiophene mixtures using polydimethylsiloxane/ceramic composite membranes. DESALINATION. 2010;258(1):106-11. 27. Liu S, Liu G, Wei W, Xiangli F, Jin W. Ceramic Supported PDMS and PEGDA Composite Membranes for CO2 Separation. Chin J Chem Eng. 2013;21(4):348-56. 28. Van Gestel T, Vandecasteele C, Buekenhoudt A, Dotremont C, Luyten J, Leysen R, et al. Alumina and titania multilayer membranes for nanofiltration: preparation, characterization and chemical stability. J Membr Sci. 2002;207(1):73-89. 29. Singh R. Hybrid Membrane Systems for Water Purification: Technology, Systems Design and Operations: Elsevier; 2006. 30. Qi H, Niu S, Jiang X, Xu N. Enhanced performance of a macroporous ceramic support for nanofiltration by using α-Al2O3 with narrow size distribution. Ceram Int. 2013;39(3):2463-71. 31. Moritz T, Benfer S, Arki P, Tomandl G. Investigation of ceramic membrane materials by streaming potential measurements. Colloids Surf, A. 2001;195(1):25-33.